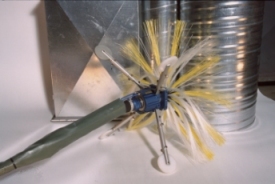 The pneumatic brush concentrator can be used with the P2001 SR brushing device. Thanks to its extendable legs, the brush concentrator can be used in air ducts with 200-1250mm of diameter. The brush concentrator is controlled pneumatically from the central unit of the P 2001 SR brushing device. The concentrator works in two ways: forcing the legs apart, thus concentrating the brush head, and forcing the legs together to make the removal of the brush from the air duct easier. The brush concentrator moves in air duct on its leg wheels together with the brush. One leg wheel is made of aluminium for possible electrical grounding.